Owner of Wishbringer Hand-Crafted Music. I write folk music, play guitar, CBG and flute (at least a little), build musical instruments (a lot better than I play them) and enjoy the wonders of music. There are excellent works from all genres of music; I've never found one area I prefer over another. My favorite music is what I'm listening to at the moment. 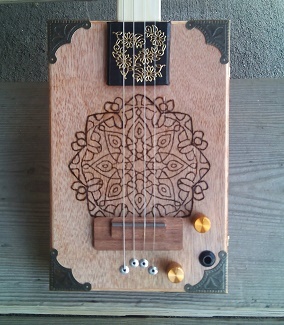 Within the field, "Handmade Music Factory" by Mike Orr and "An Obsession with Cigar Box Guitars" by David Sutton. One of the greatest mistakes when purchasing a musical instrument is buying a "cheap one" to see if it's right for you. Cheap instruments often sound bad, are difficult to play and don't last. Choose a great instrument from the beginning. A great instrument doesn't necessarily mean it's expensive. It means the instrument is made well, plays well and sounds terrific. Starting out with a great instrument may result in one becoming a great musician. Old enough to know better, too old to worry about it, getting younger every day.